So how about another pretty photo? 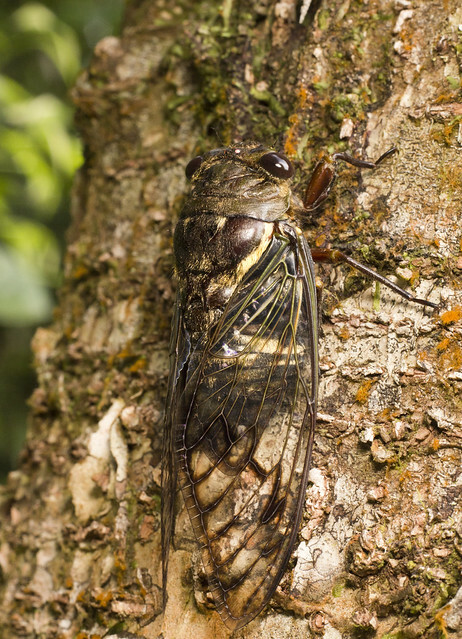 It’s the time of the year for dog-day cicadas to sing, so this beautiful photo from French Guiana seems appropriate. It’s a biodiversity hot spot in South America I hope to visit one day. Amazing camouflage on this cicada! They have always been one of my favorite insects. Thanks so much to Sean McCann (deadmike) for letting me use his photo! Ces insectes sont trop bruyants tous les matins! It is actually unbelievable how loud they can be, especially if they are only a few metres from your hammock. Now, I know the english name of that insect, it’s cicada. We call it as “gangis” in my province in the Philippines. Those insects will sing during night time in the forest.